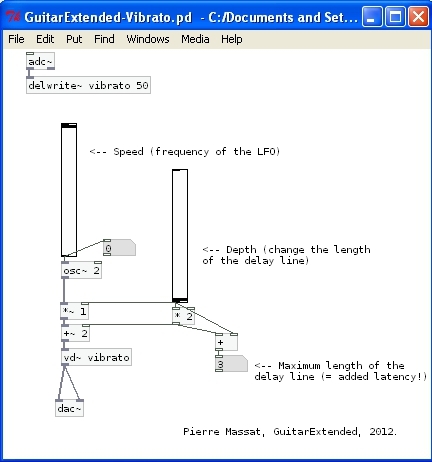 It is very easy to create a vibrato effect for use with a guitar (or any instrument) in Pd. The basic principle is the same as the one I used for the phaser/chorus example. If you feed the signal into a delay line, you can change the pitch of the signal by changing the length of the delay line. This is called the Doppler Effect, and this is what causes the pitch of a siren to appear to vary depending on the direction of the car. If the car is moving towards you, the delay line (the distance between the car and yourself) is getting shorter and shorter, and the pitch is raised. If the car is moving away from you, the delay line is getting longer and the pitch is lowered. Playing with delay lines is very easy in Pd. The only drawback of this simple patch is that it requires a non-zero delay between the input and the output to work, which means that it adds some latency (though not much). This entry was posted in Simple effects and tagged effect, guitar, pd, pure data, vibrato. Bookmark the permalink.